- 100 Stages to Bunny Blast has been added! (1501 ~ 1600). - Improved game stability. An addictive, easy, and casual game that you can play at anytime, anywhere. 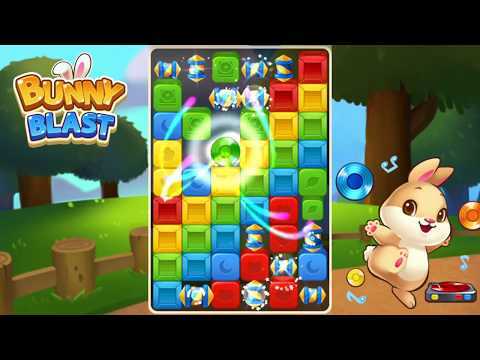 Tap to make powerful combos, destroy colorful obstacles, and enjoy the rich bunny-tastic world of fun! Bunny Blast features many hop-tastic game missions and styles that anyone can enjoy and learn quickly! FEATURES:- Addict... see more An addictive, easy, and casual game that you can play at anytime, anywhere. - Addictive and easy gameplay enjoyed by people from all around the world! - Featuring 1000 levels and constant updates to Bunny Blast. - Consists of multiple, different game missions and styles where you have to use your brain and skills to get to the next level! - Numerous boosters and powerful combos to blast any obstacles that are in the way. - Collect stars by beating the stages to receive treasures and boosts! - Compete against other people around the world and compare your ranks! - Bunny Blast can be played offline! You do not need Wi-Fi or data to play the game! - Supports 16 languages and more added! Anyone can play Bunny Blast! This game supports &apos;한국어&apos;, &apos;Indonesian&apos;, &apos;Bahasa malay&apos;, &apos;English&apos;, &apos;日本語&apos;, &apos;中文简体&apos;, &apos;中文繁體&apos;, &apos;Deutsch&apos;, &apos;français&apos;, &apos;Español&apos;, &apos;ไทย&apos;, &apos;Русский&apos;, &apos;Arabic&apos;, &apos;Portuguese&apos;, &apos;Turkish&apos;, &apos;Italian&apos;.